Lately, he [Bill English] has been working with Paula Bennett in Social Development in his role co-ordinating all policy for the election campaign. National's welfare reform plans will be unveiled soon and promise to be controversial. Only because this country is up-to-the-eyeballs in entitlement culture and learned helplessness. For instance they could promise work-testing on DPB dependents when the youngest child turns 3. That would illicit howls of outrage not only from pro-welfare advocates and left feminists but conservatives who oppose childcare outside of the home. But it shouldn't provoke controversy. By western standards supporting a parent till their youngest is three is fairly generous. And here's another way to look at it. Welfare reforms will be "controversial" because the media tells us so. "Controversy" keeps them gainfully employed. Latest September quarter figures show DPB numbers standing at 114,147. No other September quarter has ever surpassed that number. And this is after one year of National's work-testing policy applying. In terms of children around 185,000 rely on this benefit. Think in terms of 600-plus medium sized schools. In terms of cost, the average weekly DPB payment is around $513.00 so the cost tops $3 billion. I wonder what the creators of this benefit would think, or do think, now? Some time ago I examined Hansards from that time, 1972-73. There was surprisingly little debate. National would have created the DPB if Labour hadn't. 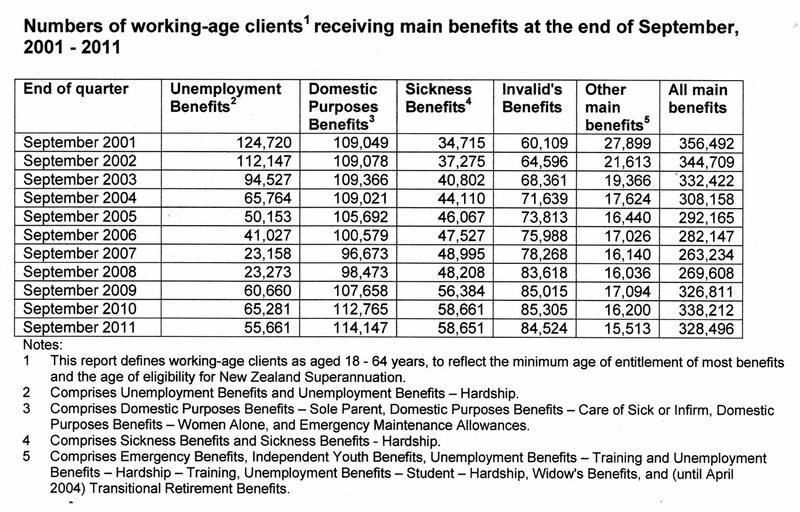 I remember reading how there were around 9,000 sole parents on emergency benefits and the relevant Minister estimated it would cost around an extra one million dollars (additional to the existing $11 million) if the emergency benefit had entitlement rather than discretionary status conferred upon it. Have you ever known a sitting member of parliament spending taxpayer money to over-estimate the cost of anything? The NZ Council of Christian Social Services publishes a quarterly Vulnerability Report. The most recent issue contained the following graph which shows the correlation between children being poor and risk of maltreatment or neglect. 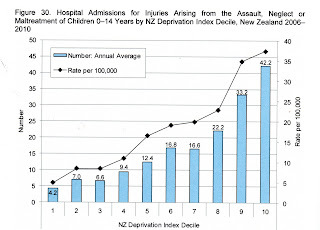 Children in the poorest decile (10 in the case because it uses the Health scale - not Education) are ten times more likely than the children in wealthiest to be admitted to hospital for reasons of maltreatment or neglect. 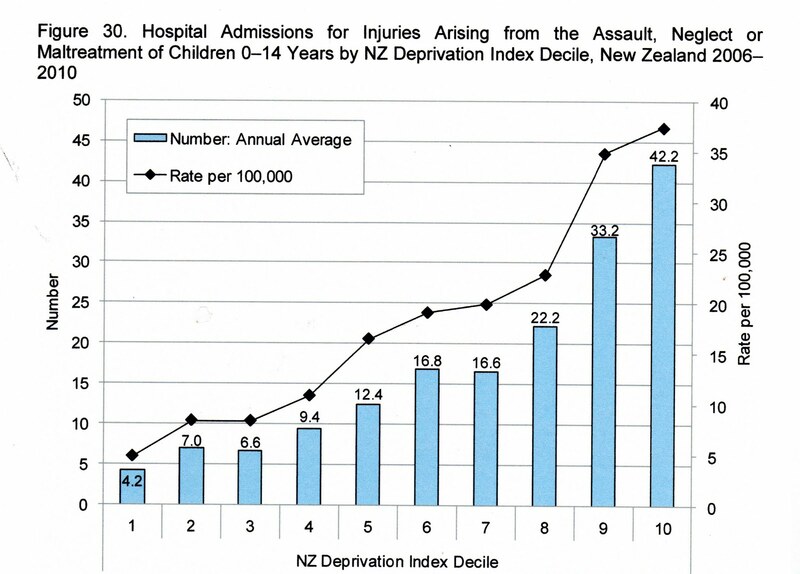 Below the graph is the angle the NZ Council of Christian Social Services takes on it. The report then goes on to point out, "Maori children and young people are over represented in [care and protection] notifications requiring further action, constituting 45% in the June quarter." BUT Asian and Pacific people have lower incomes and are not over represented. Poverty does increase stress but alone, it is not an excuse for abuse. And lest you are getting bored with the statistics, let's put a face to them. Five years old and being taught to "harden up." Christ. CHRIST. Provide a one off hardship grant of $1,000 for everyone aged 18 and over who is on an income of $30,000 or less, whether on a benefit or in paid work, to be paid by Christmas 2011. Lift benefits to at least pre-1991 equivalent levels, ensuring people have enough to live on without constantly going into debt. Extend the In Work Tax Credit to the children of beneficiary parents. There are 1,874,000 individuals paying tax on incomes up to $30,000. If we took away maybe 24,000 that are under 18 the cost of this Christmas bonus would be $1,850,000,000 or $1.85 billion. Who knows what lifting benefits to pre 1991 levels would entail. Perhaps a $2-3 billion dollar bribe all-up? Any attempts at bribery and corruption have two participants – those who offer the bribe and those who accept it. Anyone who knows about the bribe but says nothing is also implicated. For the record, I am saying something. Tapu Misa embraces Thomas Jefferson? NZ Herald columnist Tapu Misa often uses quotes from, or about people, that are intended to support her latest fad. But sometimes the people she chooses to exploit are, or were, exponents of a philosophy or ideas that are the polar opposite of hers. America's founders reckoned "Life, liberty and the pursuit of happiness" to be inalienable human rights. It seems Thomas Jefferson had in mind a less selfish idea of happiness than the winner-take-all pursuit we've seen in the last few decades. In his book Inventing America: Jefferson's Declaration of Independence, journalist and historian Gary Willis wrote: "When Jefferson spoke of pursuing happiness, he had nothing vague or private in mind. He meant a public happiness which is measurable; which is, indeed, the test and justification of any government." Unless she has experienced some sort of sea-change in thinking Tapu Misa would never aspire to the type of "wise and frugal" government Jefferson envisaged. Can you imagine the day when she writes a column calling for the abolition of income tax? SOME OF the Greens' economic policies remain quite left-wing. One of its three main planks (Kids, Rivers, Jobs) is to reduce child poverty. It would alter the Working for Families scheme so that beneficiary families as well as working ones would get the extra in-work supplement. Both the big main parties want to keep a gap between beneficiary and working parents as an incentive to work. The Greens believe people will try to find work and won't bludge (there might be a tiny number of exceptions, Norman says). This is out of kilter with the prevailing view that beneficiaries are not to be trusted. "We believe that people are good and they just need to be provided with opportunities. And the right-wing idea that we constantly have to get the stick out to take it to the poor – we just don't buy that. "Because there was a time when I was in a poor family, you know. We were supported and we got ahead because other taxpayers paid for us...Just because we were poor didn't mean we were bad." And just because people are rich doesn't mean they are bad. But you could be forgiven for believing that's what Greens think with their anti-farmer, anti-capitalist overtones. Both positions are based on conveniently collectivising people. Anyway, the point I want to make is this: poor people = bad people is a Green Party proposition. It isn't mine. But that's politics. Tell would-be voters what the nasty opposition thinks of them to further your own ends. That's why I am so glad to be out of this round of conniving and contriving. 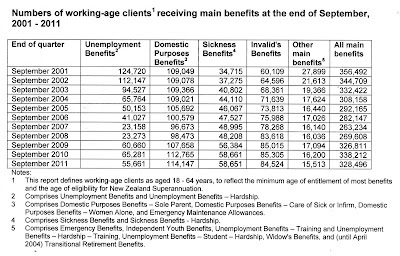 In my dealings with people of low income and on benefits I find as much diversity as amongst the opposite. But I will never support the Green's policy of giving the in-work tax credit to beneficiary families because it will not help them in the long run. And I have explained many times why. Higher benefits are associated with higher levels of unmarried or unpartnered birth. Higher benefits keep more people in the system as wages become less attractive. Where the level of household income is the same, children in working homes do better than those on benefits. Giving the in-work tax credit to beneficiary families is a policy that will do more harm than good over time. The Greens won't deal with the demonstrably probable unintended consequences of this policy. Instead they will go around the traps telling beneficiaries that National and ACT (and Labour, as they try to differentiate themselves) won't give you more money for their children because they think you are bad. That's the depth of the Green's debate. Very shallow.